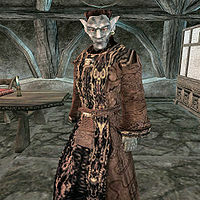 Marayn Dren is a Dunmer mage and Apprentice in the Mages Guild. He offers spells and training at the Balmora branch of the guild. He may give you a small clue during the Stolen Reports quest, but is otherwise uninvolved in any quests. He is a medium trainer in Destruction and Mysticism, a minor trainer in Alteration, and one of only two people who can sell you a Water Breathing spell. Marayn wears an extravagant robe along with an expensive belt with matching shoes and carries 25 gold. Stolen Reports: Find Ajira's stolen reports on mushrooms and flowers. There is only one other person in the game who will sell you a Water Breathing spell. This page was last modified on 23 November 2018, at 07:23.